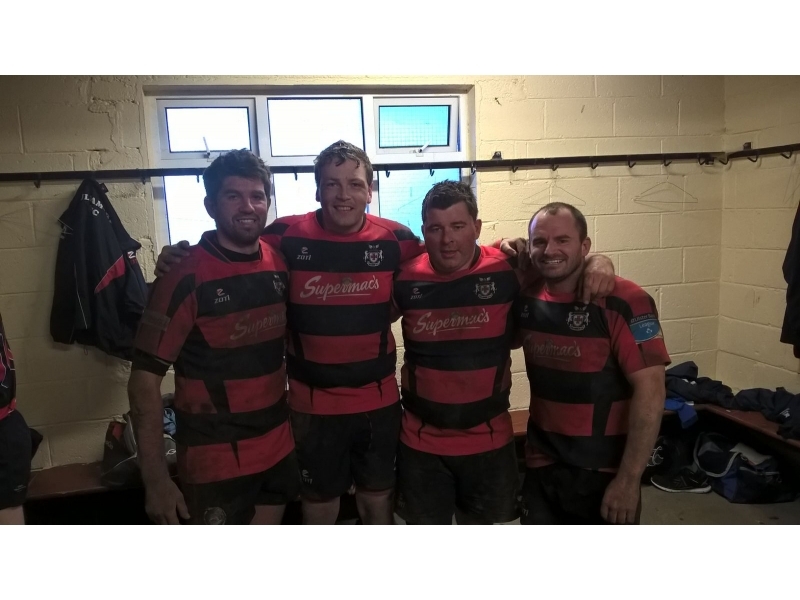 Armed with only hope, a few old warhorses and a bunch of greenhorns, Tullamore J2’s locked horns with giants of the Metro 4 league Rathdrum in an icy Spollenstown. Billed as the tie of the round, there was a real David vs Goliath feel to proceedings. The romance of the provincial towns cup is still very much alive and Tullamore pinned their hopes on the nous of old timers Paul Deering, Ned Connor & Mick Fox, coupled with the energy and strong running of youngsters Ennis, Bracken, Fogarty and McCabe. A heady brew of young and old primed for action and how they rose to the occasion. With the weather very much against ‘total’ rugby this game was always going to be won and lost in the mud of the trenches. Niall ‘Budgie’ Kane set down the first marker, crunching into a hefty Rathdrum carrier and toppling him as a Canadian lumberjack might knock a great maple leaf. Following his lead, John “the Walrus” Burns made the first rumble of the day, letting out a mighty roar as he crashed forward into the advancing Rathdrum defence to eke out a valuable 3 metre gain. From here Tullamore looked to attack wide and quick hands to big winger Brian Ryan saw the Ballycommon man make good yardage. However a series of fumbles, penalties and ruck turnovers hampered Tullamores bright start and allowed Rathdrum a foothold. They weren’t favourites for nothing and their impressive outhalf slotted the first points of the game from a well struck penalty. Stoked into a response, Sean McCabe went on one of those long trademark snaking runs that sometimes sets panic into the opposition ranks (keeping up with him occasionally sets panic into his teamsters ranks too) and on this occasion make huge ground. However Tullamore blew the opportunity with a wayward pass and the chance was lost. Rathdrum were off the hook and they then sucker punched Tullamore with a well worked maul try. 8 – 0 was a harsh reflection on things but Tullamore only had themselves to blame, the basics deserting them at key stages. Paul Deering was causing his opposite number all manner of problems at scrum time, a strong technical player throughout the years, Deering used every last drop of his vast experience to eke valuable yardage. His ball carrying was also immense and it was one of his strong bulldozing runs that lead to a simple penalty shot that Bobby O’Dea poked over to bring the score 8-3 with 30 minutes gone. From here on Rathdrum seized back the momentum and pounded the Tullamore line. However the Tullamore back row were as impassable as a trio of nightclub bouncers after 2am, hunting down the Rathdrum carriers with ruthless efficiency, Bracken and the fox haired Ennis in particular putting in a few thumping tackles and If Winston Churchill coined the phrase “I have nothing to offer only blood, toil, sweat and tears” well then Ned Connor made good on that promise, the old admiral giving a captains display of rucking, tackling, scrummaging and general disruption. Young 9 Cian “Fogel” Fogarty was all business, a snipe here, a darting run there, barking orders at his worker ants in the pack. The little general was a firebrand of defiance against larger opponents. His game is constantly improving under the excellent tutelage of John ‘Suffolk’ Burns (coach) himself a towns cup hero of yesteryear. So with Tullamore in defiant form, they made it to half time only 8-3 behind. Unfortunately it was the ten minutes after the half time chinwag that was to cost Tullamore dearest. The Rathdrum outhalf is a clever old player and he found good field position for his side to apply some heavy carries and rack up 8 unanswered points in the space of as many minutes. This very much left Tullamore with an uphill task on a heavy pitch. Trailing 16-3, on 50 mins Tullamore unleashed the heavy artillery, Mick fox, Keelan Feery and Cormac Moloney all coming in to add impetus to the Tullamore cause. The wily old Mick Fox boxed clever upon his introduction, pulling the trigger with his trusty left boot, he pinged Rathdrum back with his customary box kicking. If nothing else Tullamore weren’t going to bow out for lack of effort. The grunt and thud of the two packs as they heaved and picked and jabbed and bashed rang out in the cold springtime air. 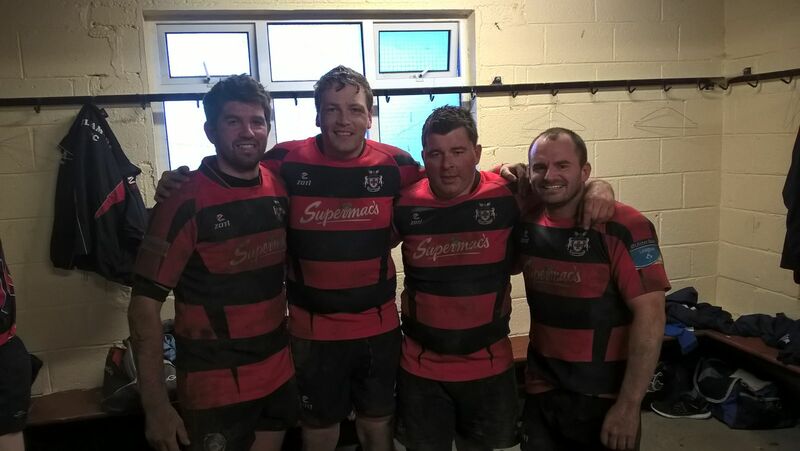 Old Tullamore towns cup stalwarts would have nodded approvingly at the battle being ground out in the mud. No quarter asked or given. The old warhorse Donal Milne revelling in the collisions and carrying the fight to Rathdrum with all he had. Tullamore went to the well once more and summoned another opportunity. The little magician Cian ‘Fogel’ Fogarty conjured up a line break with the old reliable ‘show and go’ and popped a delayed pass to the bullocking Bracken who galloped free to send Mucky Moloney under the posts. The comeback was on. Tullamore now smelt blood and went after Rathdrum with everything they had. The Tullamore pack battering Rathdrum into submission, eking out ground, inch by inch. Real traditional bread and butter rugby and it was Basil Bracken who would provide the meat filling with a tremendous lunge to the line, carrying 3 Rathdum men over the line to bring the score back to 16-15. Unfortunately the conversion kick simply didn’t have the legs and with only 5 minutes to play the clock was against Tullamore. But try Tullamore did, attacking in wave after wave and punching Rathdrum back downfield. But the Rathdrum defence stood defiant despite the best efforts of Kane, Harvey, Moloney and Ennis. They did earn a late penalty opportunity to sneak the win but alas the kick drifted wide. So no fairytale upset but Tullamore were heroes to a man and nobody could have offered anymore, the tank was simply empty. On a day when so many delivered, Barry Bracken was the Duracell bunny in the pack, going hard all day and only pausing for a few gulps of cold refreshment or to roar encouragement at those in the trenches beside him and so is this writers man of the match.